Metro staff are recommending changing the names of Metro Rail and Bus Rapid Transit Lines to colors with letters to accommodate a growing system and make our rail and bus rapid transit network easier to understand. Here is the new staff report. •Colors with letters, which are commonly used by transit agencies around the world. •Colors with numbers, which are also commonly used. •Some colors and some names based on areas. The staff recommendation will go to the Metro Board of Directors’ Executive Management Committee this Thursday (Nov. 15 ) at 11:30 a.m. with the full Board scheduled to consider the item at their Dec. 6 meeting. All Board meetings are livestreamed. Looks good. Can’t please everybody but seems reasonable. I would skip including the busway express buses. Staff probably want to make the system look more expansive but I feel it would just confuse people. Can I have one of the old signs? The express buses could be X1, X2, etc. It means Metro can accommodate up to 26 rail lines before making a change. Something for our grandchildren to worry about. It took the LACTC, one of the predecessor agencies, three years to build the Blue Line. It took Henry Huntington six months and it ran to Ocean Ave. adjacent to the beach. The Crenshaw Line should have been completed long ago but the clowns at the MTA are unable to build anything in an expedient manner. If they had been in charge in the early twenty century the two largest private transit companies in the United States, the Pacific Electric and L.A. Railway, would have never existed. Half of earths population will be living on Mars before the MTA builds 26 rail lines. There is no long term plans otherwise they would not have built the small Gold Line rail yard adjacent to the L.A. River only to replace it and virtually abandon it when they built the larger yard in Monrovia. We see the same plan with the Green Line now. And how are they going to store the additional railcars in the Expo Line Yard when the current Gold Line is severed? Is it going to be another whoops moment like they had when the Expo Line was ran into the Seventh & Flower Station and there was not enough room for both the Blue Line trains and Expo Line trains to operate efficiently. Hell, if they had any smarts the completed portion of the Regional Connector tunnel would already be in use to alleviate the current problems. What do I know, I’m only a former RTD?MTA employee who worked in Transportation for 30 years and provided them a way to collect fares, old fareboxes, on the Blue Line when it first opened since their ticket machine were not up and running. And with the agreement of my fellow Department heads avoided a complete initial failure of the TAPCard program when those who were in charge grossly underestimated the number needed to be issued to every bus operator each day. I love it, I think it’s the right move. I don’t understand, however, why we’ll now see three distinct BRTs originating at NoHo – why we don’t either have a NoHo to Chatsworth loopset or a Chatsworth to Pasadena line. Seems like that would better fit with your MO of longer lines, like the Regional Connectors A/E lines. I like the full names and comes like in London where you have District Line, Piccadilly Line, Victoria Kind. How can I formally comment on this? I only know of one or two cities worldwide that use letters rather than names, and they are extremely confusing to navigate – I’d like to get this view recorded with metro. I prefer Letters and Numbers with letters as the prefix. There’s just too many letter combinations that without numbers, you’re lost in a bunch of Letters that are difficult to figure out. 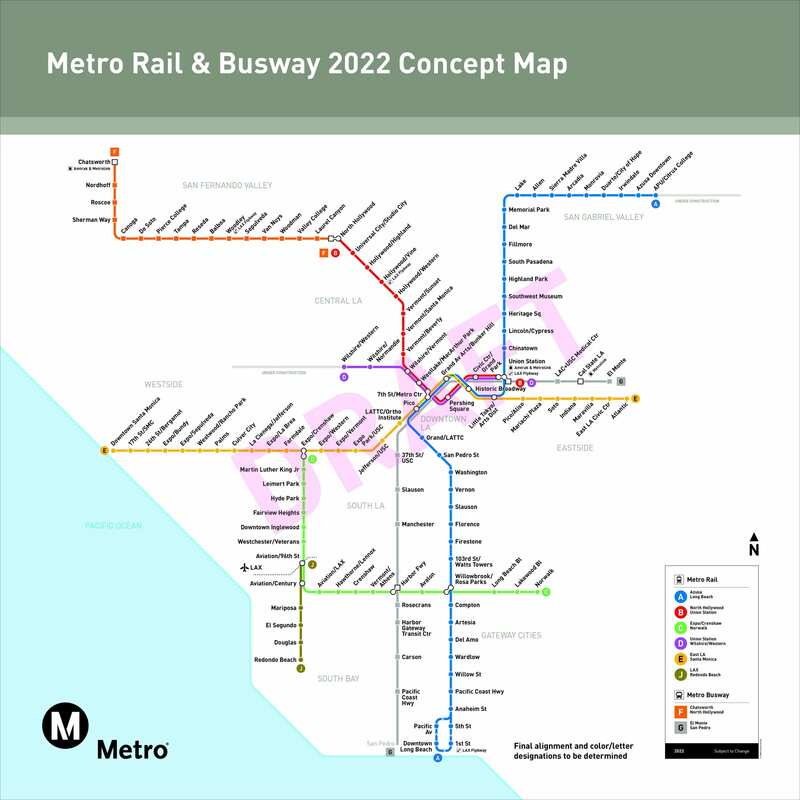 just use color with some names based on area, such as Red Line as Hollywood subway Line, Purple Line as West side subway line, Blue Line as North South LA line, Gold Line as East West LA line, Orange Line as South SFV line, Silver Line as Silver express line, green line as LAX line. Wouldn’t Aviation/LAX become Aviation/Imperial after the Crenshaw project opens? There needs to be some renaming on a few Green Line stations. In addition to Avaiation/LAX, “Crenshaw” needs to go back to Crenshaw/105 or something that doesn’t confuse occasional travelers into thinking it’s one of the many other stops on Crenshaw Blvd much further north. How will the present 910 and 950 bus routes be distinguished? That sounds good use some colors, Metro knows what they are doing. There could be significant confusion with A (current Blue and Gold to Pasadena) and E (current Expo and Gold to East LA). For the five Downtown LA stations where the A and E run on the same track, people will need to know if they’re getting on an A train or an E train, to make sure they don’t end up in the wrong corner of LA County after the lines split. This will no doubt be confusing for people switching between English and Spanish, since the Spanish (and French and German and Italian…) name for “E” sounds like the English name for “A” – both are roughly pronounced like “ay”. I can imagine many situations where a rider will ask in Spanish which line they are on, and someone will respond with English “A”, but it will sound like Spanish “E”, and the Spanish-speaker rider will be mistaken. So, while I like the use of “E” for a line we already associate with “Expo” and “Eastside”, I propose that the Blue + Gold-to-Pasadena line be given a designation other than “A”. I like full names associated with a color as in London’s “Picadilly Line”; easy to remember. Remember the old days when telephone numbers were “DUnkirk 6-2871, ATlantic 4- 4986 and BUtterfield 8-9048 Elizabeth Taylor’s number in New York City. Don’t they sound better.